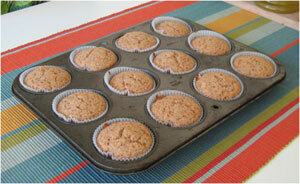 You can't beat the smell of applesauce cupcakes baking in the oven! This weekend I decided to bake some applesauce cupcakes. I found a recipe online and knew it would be a keeper! They were easy to assemble and for those with an aversion to eggs....this recipe doesn't include any. I was sceptical at first...and right away I called my daugher for her take on a cupcake recipe with no eggs on the ingredient list. But considering that I found this recipe on the Better Homes and Gardens website...well, for me anyway...BHG is just a name that you can trust. It was a good call, because the applesauce cupcakes were delicious. Notice that I'm speaking (writing) in the past tense. I took these to a get-together later in the day, and came back empty handed. If you've got your own recipe for applesauce cupcakes, send it in and become part of our baking community! We'd love to hear from you! Preheat oven to 350°F and line eighteen 2 1/2-inch muffin cups with paper bake cups; set aside. In a large bowl, beat granulated sugar and shortening with an electric mixer on medium speed until well mixed. Beat in applesauce. (Mixture will appear curdled.) In a small bowl, stir together flour, baking powder, cinnamon, baking soda, nutmeg, and cloves. Beat into applesauce mixture. Stir in raisins. Spoon batter into prepared muffin cups, filling each 2/3 full. * Bake in the preheated oven for 18 to 20 minutes or until a wooden toothpick inserted in centers comes out clean. Cool in muffin cups on a wire rack for 5 minutes. Remove from muffin cups. Cool completely on wire rack. To make the frosting: in a medium saucepan, combine brown sugar and butter. Cook and stir over medium heat until melted. Remove from heat. Stir in powdered sugar, the 1 tablespoon milk, and the vanilla. If necessary, stir in enough additional milk, 1 teaspoon at a time, to make spreading consistency (if frosting thickens, stir in additional milk). Frost cupcakes. Recipe Source: Better Homes and Gardens.